Anne has worked in the financial services sector for the past 26 years. She is a Member of the Institute of Bankers in Ireland, the Securities Institute and the Life Insurance Association and is an active supporter and patron of the arts both in Dublin and London. John is the founder and Chief Executive Officer of Kestrel Capital. He has over 30 years experience in the financial services sector advising Individuals, Family Offices, Corporations, Charities and Pension Funds on all aspects of strategic investment planning and asset allocation. John has held a number of senior roles in major international corporations during his career including Head of the Private Client division of the Investment Bank of Ireland and Director of the Personal Financial Services division of KPMG Ireland. He joined Merrill Lynch in 2000 to set up and develop the banks Irish Wealth Management business. As a Senior Vice President of Merrill Lynch he chaired the Advisory Council to Management in EMEA, this group was charged with guiding and setting front office strategy for the region. He was a member of the Executive Leadership Team of Bank of America Merrill Lynch in Ireland and responsible for the successful transition in 2014 of the Wealth Management business to Julius Baer where he held the role of Managing Director and senior advisor of the Irish business. John is a Director of Orbis International (Ireland), a charity devoted to transforming lives through access to quality eye health. Kevin Baird has worked in heritage and tourism projects for 25 years. Kevin started as an architect in private practice in the late 1980s and over the next decade his voluntary effort in heritage and community activities developed into full time work. He set up the Heritage Lottery Fund operation in Northern Ireland in 1998 and enjoyed the role until 2006 when he established the Irish Heritage Trust operation in Dublin. John O’Driscoll joined the team in Strokestown Park in 1998 where he had responsibility for the ongoing restoration of the Walled Gardens. 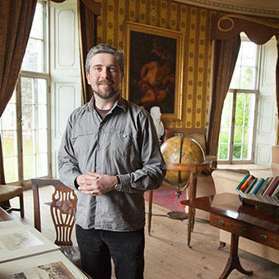 John has played a key part in further restoration projects in Strokestown Park including the Gentlemans’ Study/ Darkroom, the Family Mausoleum, the Courtyard Project and Woodlands. He has also worked with Dr Ciaran Reilly in organising the International Famine Conference in Strokestown Park for the past 5 years. John is a director of Houses, Castles and Gardens of Ireland and was Chairman of this organisation between 2011 and 2013. John is now working with The Irish Heritage Trust to continue to safeguard Strokestown Park and The Irish National Famine Museum into the Future.